SAN ANTONIO, Zambales: Japanese troops stormed a beach in Zambales on Saturday in joint exercises with US and Filipino troops that officials said marked the first time Tokyo’s armored vehicles rolled on foreign soil since World War 2. 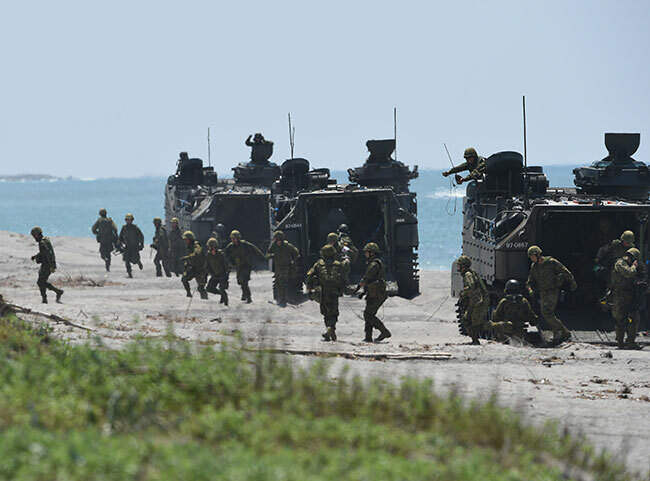 The small Japanese contingent played a humanitarian support role in the drill after US and Filipino marines made an amphibious landing to retake Philippine territory from a “terrorist” group. Fifty unarmed Japanese soldiers in camouflage marched behind their four armored vehicles and picked up Filipino and American troops playing the role of wounded combatants while moving inland over sand and sparse bushland. The exercise, codenamed “Kamandag” (Venom), marked the first time Japanese armored military vehicles were used on foreign soil since the country adopted a pacifist constitution after its 1945 defeat, said Japan’s Maj. Koki Inoue. “Our purpose is to improve our operational capability and this is a very good opportunity for us to improve our humanitarian assistance and disaster relief training,” Inoue said, adding Japan was not involved in the drill’s combat component. The exercise was held at a Philippine navy base facing the South China Sea some 250 kilometers (155 miles) from Panatag (Scarborough) Shoal, a territory claimed by Manila that was seized by China during a 2012 naval stand-off. * You can't call this NATO East but its an important step. The US military is slowing but surely lining up its allies in an attempt to contain China. * Everyone forgets that China has already committed an act of aggression against a country in the region. In this instance the seizure of Philippine islands. The world has turned a blind eye...pity. * The Japanese are most assuredly increasing the capability of their military at a pace that we might have trouble recognizing or appreciating. The Chinese won't make that mistake and unfortunately neither will the S. Koreans (and the North either...you do know that reunification of those two countries only provide breathing room before there will most assuredly be a shooting war between Korea and Japan...the ancient feud just won't die). * Taiwan is a Chinese province. They just don't know it. When China makes a move against them it will be completed before our National Command Authority gets to the office to begin the debate. That makes the Philippines the most likely "second" target when things go hot. Will we see simultaneous ops in Taiwan and the Philippines? Doubtful but we can expect them to move with speed once they've wrapped things up in Taiwan. We should husband our forces and not waste effort in repelling an assault that will surely succeed. Hurts to say but Taiwan should be supplied to bloody the Chinese with the idea that the real defense will start in the Philippines.